Google is known for its interest in life sciences. While Google’s venture capital arm invested in genetic testing and analysis company 23andMe, it also ran its own Google Life Sciences division. Verily formerly known as Google Life Sciences has partnered with GlaxoSmithKline to form Galvani Bioelectronics. Galvani Bioelectronics, a joint venture between the Internet and Drug giants will be working on research and development of implantable bioelectronics devices. These devices, with potential uses in the treatment and rehabilitation of patients suffering from arthritis, diabetes and asthma will use electrical signals to manipulate nerve impulses. 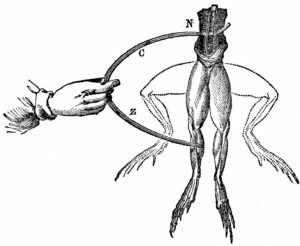 The new company derives its name from Luigi Aloisio Galvani, an Italian scientist who was the first person to explore bioelectricity. His experiments with electrodes and frog legs are well documented. -states GSK’s Moncef Slaoui – Chairman of Global Vaccines, who also established GSK’s investment arm for bioelectronics. The new company Galvani Bioelectronics will have its bases in GSK UK’s R&D center and Verily’s San Francisco center.